With the speed and sometimes reckless abandon Hollywood typically cranks out remakes at, it is a significant surprise that it has taken roughly 29 years for the Adrian Lyne directed Jacob’s Ladder to get a treatment for the 21st century. That treatment is coming February 2019, which makes it a good time in the interim to revisit (or possibly visit for the first time) the cult classic original. THE STORY: It’s October 1971, and people are still losing their lives in the Vietnam War. On watch near a war hotspot is the 1st Air Cavalry Division, a cavalry of which combat medic Jacob Singer (Tim Robbins) is a part of. Without warning, they are attacked, and many are killed, though not by the hand of the enemy. Instead, they seem to be succumbing to some mental effect. Jacob manages to survive this, but not before getting stabbed. The year is now 1975, and Jacob makes his living in New York as a postal worker with his girlfriend Jezzie (Elizabeth Peña). Life isn’t terrible. Yet he suffers from flashbacks to the battleground often, along with memories of his wife and late son. To top it all off, Jacob begins to see increasingly frequent nightmarish beings—demons, if you will. Why? Is it “simple” PTSD? Or, has he been transported into a world that is different than ours? WHAT TO LOOK FOR: Jacob’s Ladder—not a commercial success nor a critical one upon November 1990 release, kind of still flies under the radar to this day. However, enough of an audience has given this movie a long-lasting legacy. Look closely in your favorite psychological horror or thriller and chances are there’s some of Jacob’s Ladder embedded within it. Be it The Sixth Sense, the mega-popular video game franchise of Silent Hill, or television’s American Horror Story, a good chunk of horror owes thanks to director Adrian Lyne’s feature. Lyne, who previously delved into the horrific with the genre influencing and defining Fatal Attraction (despite it coming well after Play Misty for Me), took it up a notch here. For anyone who needs a super clear and laid out narrative, that is not this movie. Do not go into this with a belief that Jacob’s Ladder will answer every question that its script directly or indirectly alludes to, which can be annoying on a small level. Even thematically, Lyne’s movie probably isn’t as deep as its title alludes to. While a good amount of open-endedness never hurt anyone, the movie seems mostly concerned about the journey, not the destination. From the get-go, the viewer senses something is off; be it the consistent foggy haze the feature seems to be permeated in, or the occasional bits of dialogue or lingering images that suggest Jacob’s delusions being more than the result of PTSD. The twisty reveal happens right at the end, but it’s right there at the beginning upon closer inspection in plain sight. 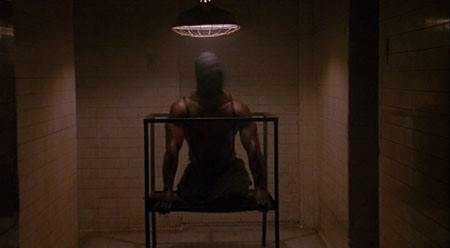 Jacob’s Ladder takes us immediately into the psychological head space of the titular character played by Robbins. Very much a cerebral performance that demands a lot out of the actor, the future award winner for Best Supporting Actor carries this film in the lead role. It’s a tough task Robbins is asked to do, as so many of the emotional moments that flesh out Jacob’s character are rarely seen in “real time”, making it fall upon him to respond to a memory, a picture, etc. The gamut of emotions Robbins covers span the entire spectrum, and he seems as drained through it all as we are in watching him. He’s the conduit for the audience; and his performance is so effective because ultimately, he’s just an average, every day, slightly socially awkward guy dealt a grotesque hand he cannot make sense of. A GREAT MOMENT: The image above is from the tense ice bath scene that is two minutes of cold chilliness. But the unforgettable moment of Jacob’s Ladder is—unequivocally—the party and dance sequence. Set to the track of James Brown’s funky My Thang (fittingly from his album titled Hell), it begins with an ominous and foreshadowing line from a palm reader, but starts simple enough with Jacob feeling like the fish out of water in a hot house party and clearly not feeling in the mood to dance while his girlfriend, Jezebel (a wonderful Elizabeth Peña here) just wants to have some fun. As he pulls away and observes the scene, his focus diverts to a couple getting steamy on the couch, then to the partygoers increasingly resembling otherworldly beings, followed by a mysterious individual seemingly serving watch on the evening’s events, and finally transitioning to bloody-mouthed animals looking to take a bite out of him. That’s only part of it. Once Jacob’s loses his glasses, finds them, and puts them back on, he returns to see Jezebel bumping and grinding with a male on the dance floor, almost under the influence of something. This male reveals himself to be a creature with a protruding tail, who violently begins to have his way with Jacob’s girlfriend, culminating in an absolute shocker. Everything about this scene is perfect, from the JB lyrics (squeeze me, hold me, roll me, give me a thang) to the strobe lighting that creates the disorienting and distorting effect in the smallest of things. Lastly, the manic head-shaking present in this movie has been replicated in many other productions. Hard to watch, but so impeccably put together that one’s eyes cannot pull away from what’s being shown on the screen. 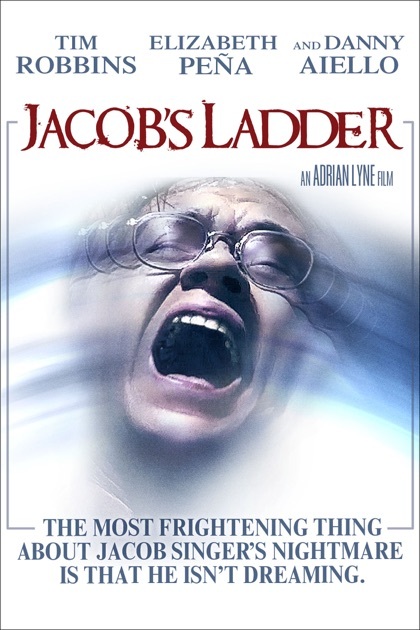 THE TALLY: Extremely influential to many horrors and thrillers in the decades to follow, Jacob’s Ladder ascends and descends into the darkest recesses of the human psyche in unforgettable ways. It’s What to Watch. Photo credits go to horrorfreaknews.com, amazon.com, gramunion.com, and bloody-disgusting.com.